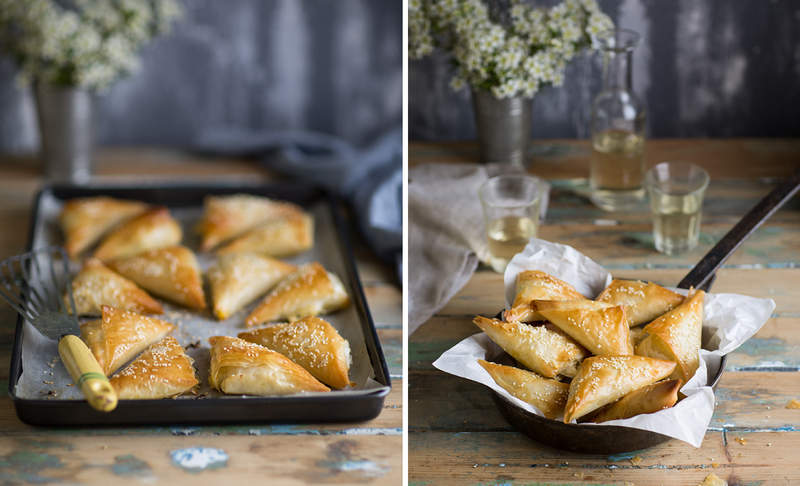 We collaborated with Sam Linsell of Drizzle and Dip, and the upshot was these crispy, golden, snacky phyllo parcels. Made with Natures Garden Sweetcorn, cheddar, ricotta and a smattering of chilli, they’re a great little party snack idea. Now tell us you aren’t just a little bit hungry? Microwave the sweetcorn in a covered microwave dish with a quarter of a cup of water on high for 2 minutes. Drain and set aside. Alternatively plunge into boiling water for 2 minutes. Melt butter in a non-stick pan and fry the onion over a gentle heat until soft and translucent. About 4 minutes. (You do not want to brown the onion.) Set aside. In a bowl, mix the ricotta, fried onion, cooked sweetcorn, grated Cheddar, basil, salt, pepper and chilli, if you are using it. Ensure it is well mixed and forms a paste-like consistency. Check the seasoning and adjust accordingly. Gently remove two sheets of pastry from the packaging – cover the remaining pastry with a clean, damp tea towel to prevent it drying out. Separate the pastry sheets and lightly brush one with melted butter, then place the unbrushed sheet on top. Brush this with butter too. Cut the pastry sheets vertically into four equal pieces or, if you want to make smaller pies, five pieces. Brush the strips with butter too, leaving the bottom bit, where the filling goes, unbrushed. Place a dollop of the cheese and corn mixture (about a dessertspoonful) at the bottom end of each piece of pastry and fold over to form a triangle. Continue to fold the parcel over as you work your way up the strip of pastry, maintaining the triangle shape. Repeat with the other sheets of pastry. Place the pies on a lined baking sheet, brush with melted butter and bake for 20 – 25 minutes, or until golden brown.